Fake Organic Pet Food: Are You Getting Duped? Important news for pet owners and guardians who spend a lot of extra money (sometimes an awful lot) on organic pet food: That so-called “organic” pet food may not be organic. And may not even be good for your pet. 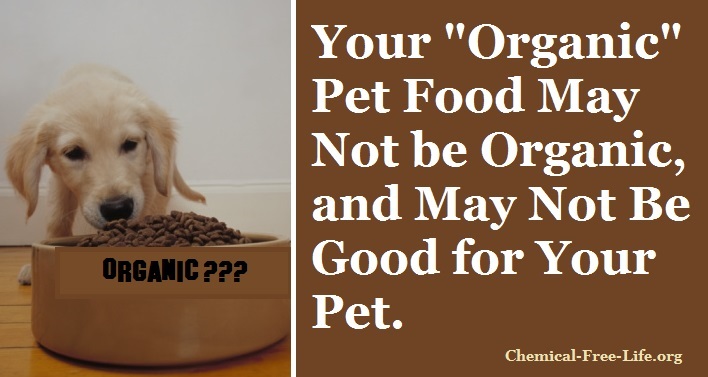 The organic pet food industry is an unregulated one and it is possible for pet food manufacturers to slap an “organic” label on pet food that is not at all what their label claims. Remember that the synthetic chemical-free demands of a growing number of consumers has turned the ‘natural’ and ‘organic’ ends of the food industry into a multi-billion dollar cash cow. With no agency regulating organic claims on pet food and no negative consequences for doing so, we should not be surprised that at least for some pet food manufacturers, “organic pet food” has become little more than a marketing ploy to manipulate consumers to part with their money. Does Your Dog Really Need to Eat Organic Food? Technically, the NOP mandates that if companies want the coveted organic seal on the food, at least 95 percent of the food must be organic by weight. Labels can say they’re “made with organic ingredients” if at least 70 percent of the ingredients are organic. Here’s where it gets tricky: pet food companies can say they’re organic even when their food doesn’t contain organic ingredients because no agency requires proof of the pet food health claims. Unfortunately, being “organic” does not guarantee that food is good for your pup: Even if what you buy does contain organic ingredients, they may have been heavily processed in order to make the food shelf stable (thus stripping them of their nutritional value.) Plus, according to Greg Aldrich, PhD, research associate professor and pet food program coordinator at Kansas State University, it’s difficult to secure the raw ingredients to produce a truly organic pet food within the framework of the AAFCO guidelines. So the food may be organic, but not nutritionally complete. The word “organic” is often used to increase the seeming value of the food (and to charge you more!). But because the commercial dog food category is still lacking in strict regulations, there are some organic brands that are using chemicals and preservatives in their food. Others will slap on an organic label without being completely honest about their ingredients. So you might be paying more for food that isn’t worth it. “There is no documented positive, nutritional, health, or safety benefits to organic,” Aldrich says. There have been studies about the pros and cons of grains, raw food, and specific ingredients, but research on organic ingredients in a dog’s diet is surprisingly lacking. So we really don’t know — they could be healthier for pups or they could be the same. What we do know? The most important thing is that your dog eat a healthy diet made with real, high-quality ingredients that are nutritionally balanced. Pingback: The Organic Pet Food Scam – FIREPAW, Inc.